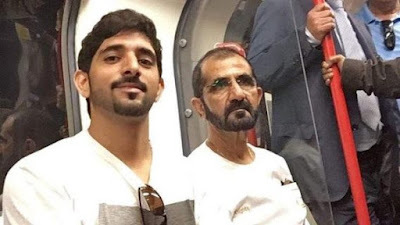 Sheikh Mohamed is Dubai's Prime minister.He probably virtually drips of wealth lol.. but they put all that aside as they took a leisure ride on one of London's Underground trains..
Hamdan bin Mohammed Al Maktoum shared of photo of him sitting on the Tube next to his father, Sheikh Mohammed bin Rashid, the Ruler of Dubai, United Arab Emirates (UAE). 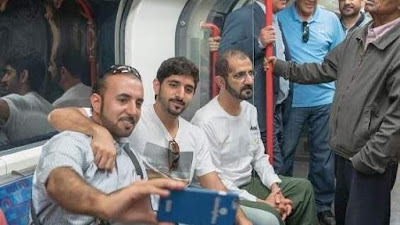 They were dressed in casual clothes, with the Crown Prince of Dubai wearing a T-shirt and jeans as he posed for photos and videos. Their plain clothed entourage can also be seen in a video posted on Instagram, standing on the busy Tube next to members of the public.